Back in the days of tire wars, we became accustomed to the influence of tires on F1 races, with Michelin dominating for a while and then Bridgestone having an edge. Personally, I never liked that situation, preferring that it be a straight contest between men and machines and so I was glad that the sport finally opted for one make of tire only. My thought was that this would make a level playing field for all the teams and we would see who really could build the best car and who were the best drivers. But that was before Bridgestone and the FIA decided to complicate matters by having hard, medium, soft and super soft tires, the teams then being required to use both of two available compounds during the race. Apart from forcing the use of what might be an unsuitable tire for part of the race, this also puts a considerable amount of power in the tire manufacturer's hands; they choose which two compounds will be available at each race and sometimes their choice has been questionable. The complaining has slowly multiplied in strength this year as first one team and then another finds itself at a disadvantage. It has been quite noticeable that the Ferrari likes a softer tire than most and does well when the weather is hot, McLaren being better on hard tires and prospering when cooler weather prevails. The fortunes of these two teams have see-sawed with the weather from race to race and led us to speculate erroneously on the development pace of both. The plain fact is that their cars are about equal in performance and it is track temperature that is making the difference. Taking this into account and glancing quickly at the weather forecast for Spa this weekend (50% chance of rain throughout the weekend and temperatures likely to be cool therefore), we can confidently expect that McLaren will be on top again in Belgium. Had I known at the beginning of the season what I know now, I could have made some very accurate predictions before the races and looked pretty wise as a result - but perhaps that is always the way. Hindsight is a wonderful thing. Whether this is good for the sport is doubtful, however. It has made the championship battle very close but in a rather artificial manner. The resemblance to the days of the tire wars is a little uncomfortable, with tires having this big an influence. Ferrari are now saying that Bridgestone's tire choices for the remaining races tend to err on the side of being too hard and that this puts them at a disadvantage. We can say that this is merely the luck of the draw and is the result of their designing a car that is easy on tires but that does not alter the fact that it is the tire that is deciding this year's championship. This becomes even more worrying when we read between the lines of the report that Bridgestone has developed a wet weather tire for all conditions and wants to do away with the present standard and extreme wet options. All well and good, we may think, but then the Japanese tire company's director of motor sport tire development adds the information that use of the new tire would require a rule change. How telling a statement is that? In it is implied confirmation of what we suspected all along - that Bridgestone pressured the FIA into making the silly two-compound per race rule in the first place, presumably to ensure that the company name still receive maximum publicity. It is difficult otherwise to see why Bridgestone would invest so much money in developing a new tire, without knowing beforehand that they could persuade the FIA to accept it. And now we can see that tires are influencing the sport in ways far beyond our expectation. 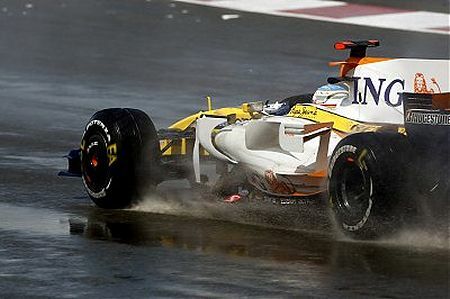 It is not only the car manufacturers that are using F1 as a testing ground, it seems. How would we feel if one of the teams, Honda for instance, were to develop a clever little tweak that made their cars faster and then squeezed the FIA to make it legal? It seems back to front, to me. I can only presume that it is Bridgestone's position as sole supplier to F1 that gives them the influence over the FIA that they appear to have. This surely cannot be healthy for the sport and I hope that the FIA demonstrates its independence from such pressures by turning down any change in the tire rules to suit the supplier. The new tire may be very ingenious but, if it breaks the rules, it should not be allowed. It is public domain that Bridgestone came up with the two compound nonsense after they won the contract. I don't understand why they don't ship all the compounds to each race and let the drivers run what they like. That would surely generate more discussion about tyres and it would let Ferrari have a softer tyre than McLaren and let Hamilton have a tyre that suits his agressive driving technique. If the drivers want to mix compounds let them. I wonder if Bridgestone's people even said "we want it to be like ChampCar" during negotiations. If you're ever watching the Indy Racing League and want an easy drinking game, drink any time someone on the air substitutes the word "Firestone" for tire and "Ethanol" for fuel. If Bridgestone want marketting, it is done -that- way. The reason for mandated tires is two-fold: an artificial control on mechanical grip and therefore speed, and an excuse to control testing time: since you cannot change them, the teams do not need to spend much time testing them other than to decide how much time they'll spend on the option. As a compromise, I think lifting the "use both compounds" requirement may suffice, since giving the full range of tires to the teams on any weekend would probably be ruled out of the question upon proposal. I am fully behind chunter in this question. Drop the two-compound-rules and let the teams decide wich tires they want to use. After all, i think they know best of all wich tire fits their cars the best at the race they're at at the moment. And one wet tire for all wet conditions sounds ridiculous to me, there's no way one can manufacture a tire that can cope with everything from a small summer rain in Europe to the monsoon in Japan. No way!